[Drummer] Clayton Gore: [Vocalist] Jason [Barron] had been trying to get people together to play in the style of older death/doom metal, like the first couple Paradise Lost albums, My Dying Bride, etc. for a couple years and had a couple false starts with people that just couldn’t do it. Then he met [guitarist] Jeff [Breden], brought me into the fold and we were off and running. We got some songs written and after running through a couple of potential members landed on our current lineup. We decided to immediately record the album and get the live rehearsals happening. [Guitarist] Jarrett Pritchard: I think what is unique about it is that for one thing, Clayton and I are working together again after many years since the Eulogy days. I think the other is that things with us come together relatively quickly musically speaking. It feels very fortunate to have the personnel together that we do where there are so many resources to get the music moving. They’re releasing their debut album Divina Autem Et Anile this Friday (2/1) via Ceremonial Records (pre-order), and we’re premiering a stream of the whole thing ahead of its release. The album was produced by the band’s own Jarrett Pritchard (who’s also produced records for 1349, Goathwhore, Exhumed, Gruesome, and others), and it features soaring clean guest vocals from Heather Dykstra (who also guested on a Eulogy EP) on “Soulstench” and “Thrown to the Wolves,” as well as guest backing vocals by 1349’s Tor Stavenes on “Thrown to the Wolves” and “Black Ritual.” “All of the vocal parts in ‘Soulstench,’ the Latin, all of it, were [Heather’s] ideas,” Jarrett told Decibel. 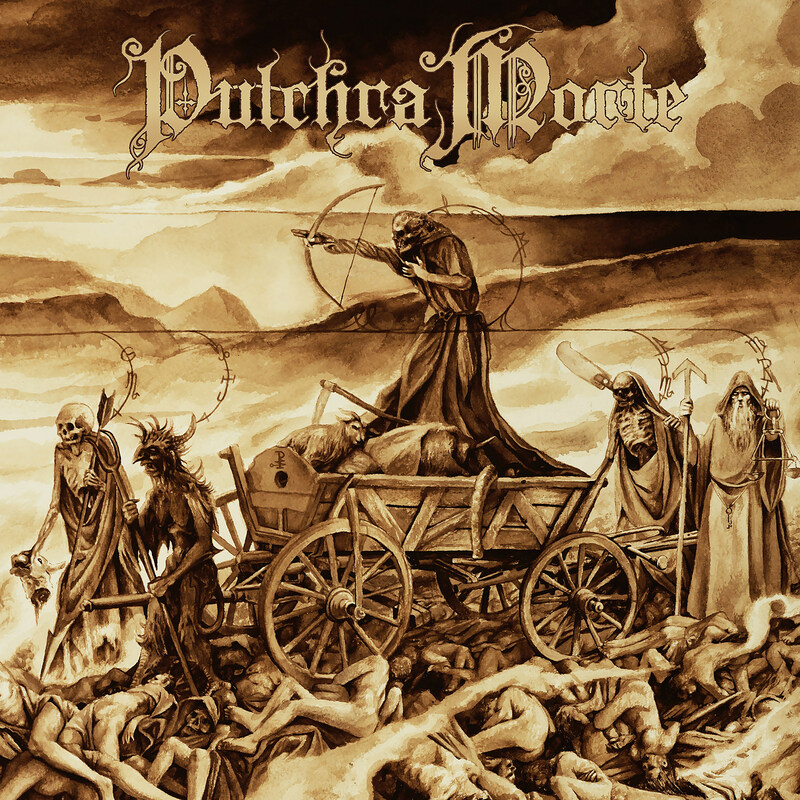 Pulchra Morte also incorporate cello (composed and performed by Naarah Strokosch) on “Ignis Et Tempestas,” and the more “pretty” touches like the cello and Heather’s vocals blend perfectly with the band’s more brutal tendencies. As they said, they went for classic death/doom in the vein of Paradise Lost and My Dying Bride, and if you like those bands (or any of Pulchra Morte’s members’ other bands), you’re probably gonna like this too. You can hear the whole thing for yourself over at BrooklynVegan.